Glentoran manager Gary Haveron. Pic by INPHO. Sacked Glentoran manager Gary Haveron has defended his record at The Oval in the aftermath of a dismissal following 17 months in the hot seat. A Board of Directors statement confirmed the decision based on how “expectations from the club and supporters were simply to see an acceptable degree of year on year progress. Unfortunately, that has not been the case”. However, the former Carrick Rangers boss backed his rebuilding work with the Belfast club. 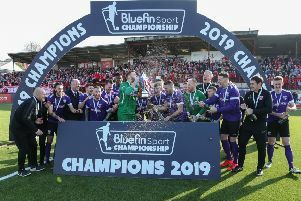 “When I arrived we were sitting 11th and now the club stands inside the top six of the Danske Bank Premiership and with an Irish Cup quarter-final tie to come,” said Haveron. “We secured safety at the end of our first season and then can now point to the league position and Irish Cup run as signs of progress. “I’m not happy with results this season but we made a bright start before injuries to key personnel led to a plateau. “I thank the players for their efforts and, of course, the staff. “I got a phone call from the chairman and everything is still raw, so I will take a few days to assess everything and how we could have done better. “But we gave everything to the club, 100 per cent effort towards working for Glentoran. “I do not believe anyone could have worked harder and I wish everyone was fully aware of all of the facts. Despite suggestions from sources that a significant budget reduction restricted summer plans to rejuvenate the squad, the Glentoran statement described directors “reluctantly reached the conclusion that despite strong backing for Gary’s rebuilding plans in both the summer and January transfer windows, results and performances in recent months have shown little or no improvement on the same period last season”. The directors praised Haveron’s dedication in that “since his appointment, Gary has shown unrelenting enthusiasm and commitment to the role and to securing a positive future for Glentoran”. It continued: “His work rate never wavered and he has been an outstanding ambassador for the club. A club statement on Glentoran’s managerial situation is expected tomorrow (Thursday).